I received this book from the Raincoast Books for review. This does not impact the content of my review. As You Wish has an intriguing premise. 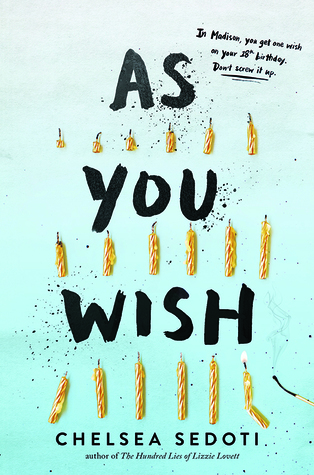 A small town with a big secret – everyone gets one wish on their 18th birthday and it comes true. The book plays around with this idea, the moral questions around is wishing good or bad, are wishes good or bad, are people good or bad (and does their wish represent this or impact it). Eldon struggles with choosing his wish and spends the majority of the book trying to decide what it should be. He’s heartbroken. He feels a ton of family and societal pressure. He wants to make the right choice, the right wish. As You Wish is so interesting. The questions it poses really make you think. Eldon was… frustrating. He was a jerk. But he started to realize it. He was a self-absorbed high school senior who was used to getting everything he wanted and suddenly wasn’t the top dog anymore. It’s a pretty standard trope. And it got kind of flipped on it’s head. The character development in this book made me smile. Although Eldon, struggling with his identity, some intense family tragedies, and the usual end-of-high-school pressures, did make me grimace quite a few times throughout the book. I did, however, learn to like him. An intense, and sad at times, read that explores how our choices and wishes can come back to haunt us. The novel has an interesting style. Eldon’s story is told throughout but occasionally the story of a person’s wish is narrated by a narrator who is a character all their own. Eldon spends the novel collecting people’s wish stories. What did they wish for? Why did they wish for it? Do they regret their wish? If they could go back, would they wish for the same thing? Wishes ranged from the simple to the complex, the rash to the incredibly thought-out, the unobtrusive and personal to the far-reaching and collective. The wish stories were easily my favourite part of the novel and I wish (ha!) I could read more of them. Overall, an interesting and enjoyable novel but not one that I feel drawn to reread over and over again.